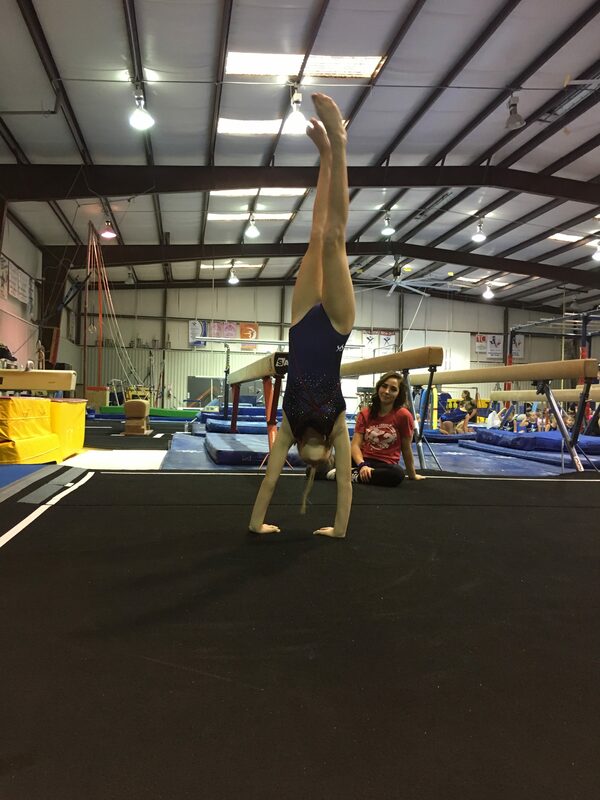 The first meet of the season for our Pre-Team and Cadet Team took place at Texas Star Gymnastics three weeks ago. The gym was packed with family, friends, and of course the amazing athletes ready to show off their skills. The large crowd did not deter the girls from doing their best for the judges, and if anything, was a catalyst to giving a great performance. The K2 athletes participating in the National Anthem to kick off the competition. 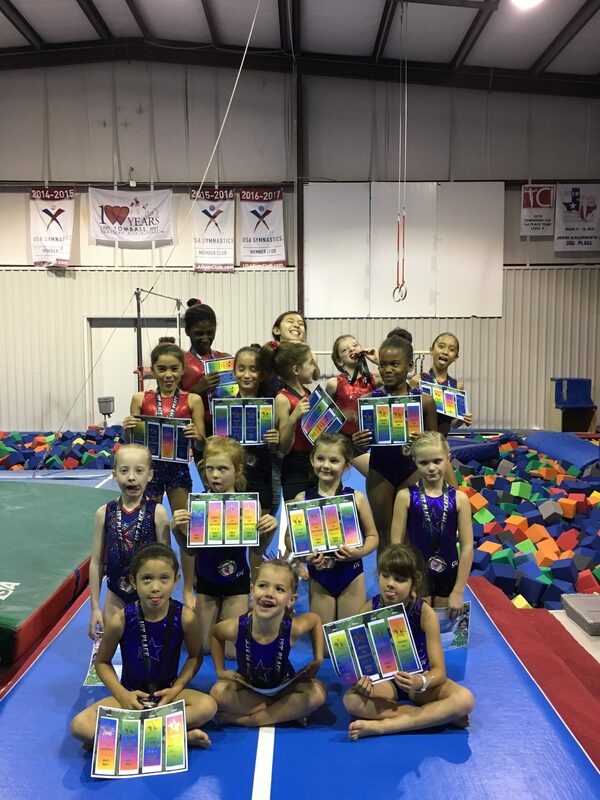 The diversity of the athletes competing from K2’s Gym Gems (preschoolers) to our Platinum level girls (L3 and up) made the meet that much more special. 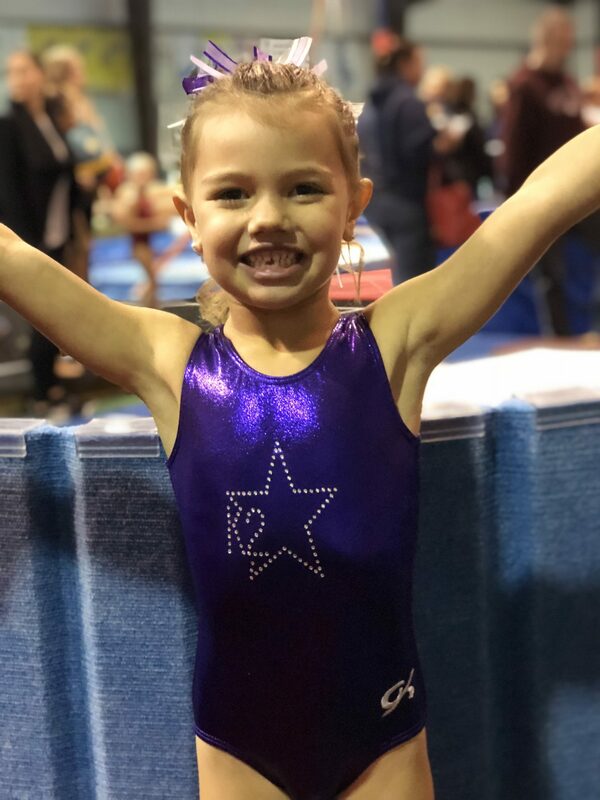 Being able to see the progress and skill difficulty increase from level to level helps parents and athletes understand the progressions gymnasts must learn before moving up. A group of our athletes from Session 1. 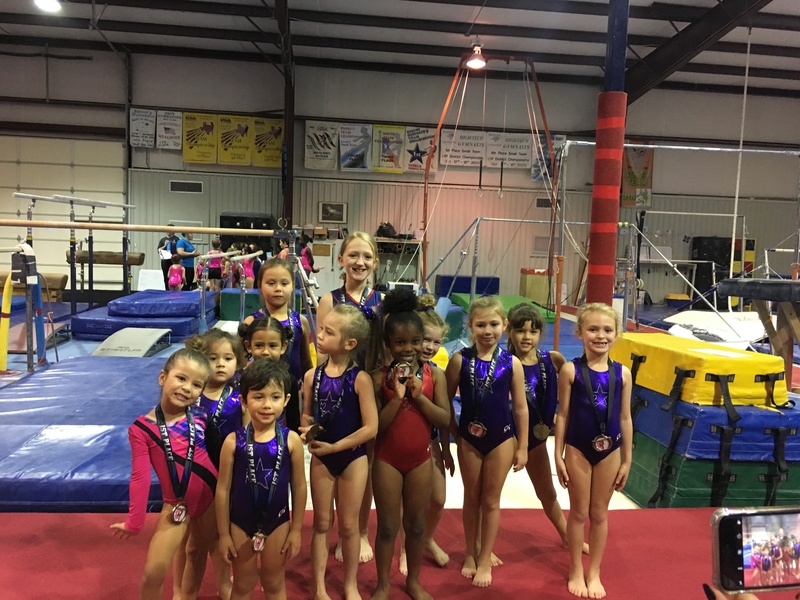 K2 sent 55 athletes to the competition at Texas Star. Starting the girls competing at an early age is a brilliant way for the girls to get a grasp on how the competitive aspect of our sport operates. It also gives them the opportunity to compete in a low stress and friendly manner. The girls were vibrant and expressive with their composure and execution of their practiced routines. Being the first meet of the season, and with plenty more to come, we are looking forward to seeing the the girls improve with practice and competition exposure. Audrey performing a handstand on floor. 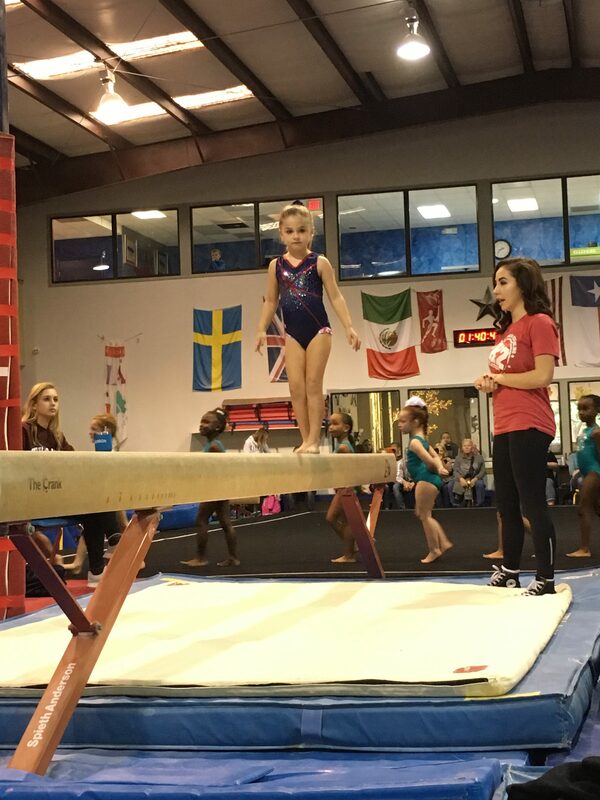 Alison performing her beam routine. 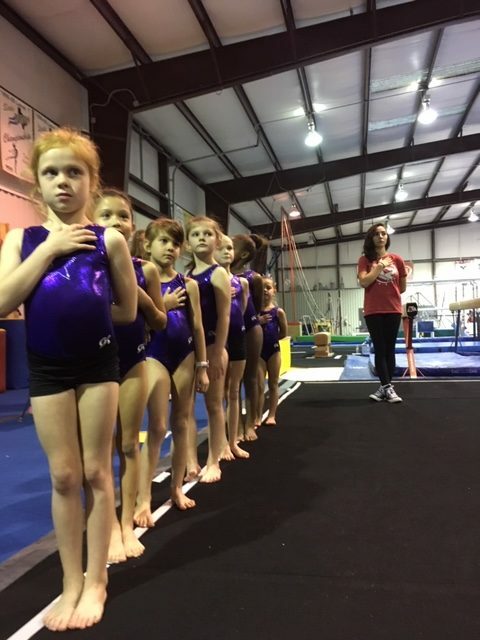 Experience is the best teacher and will give the girls the best opportunity for success in their future gymnastics careers. These girls have so much potential and K2 looks forward to seeing them perform as the season continues. The next meet will be held this Saturday, December 8th at Basel’s Gymnastics. Check out those silly faces and all those rainbow ribbons! Looks like we have some athletes moving up a level. If your athlete would like to participate in our Cadet program, email us at frontoffice@k2academy.com. The season runs November through May with one competition per month. Gymnasts can join at any time. Previous Previous post: A Christmas Experience at K2 this Sunday, December 2! Next Next post: Open House this Saturday!